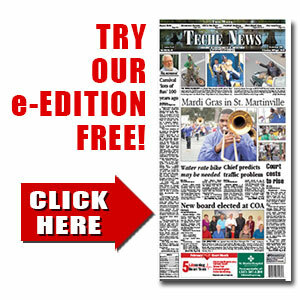 Teurlings tops SM Lady Tigers | TecheToday.com | Teche News | St. Martinville, La. St. Martinville’s Lady Tigers volleyball team suffered a 3-0 loss to the defending Division III state champion Teurlings High in The ’Ville’s second district match last week. The Lady Rebels (17-1, 2-0) swept St. Martinville, 25-16, 25-16, 25-20 last Tuesday, Sept. 27. The Lady Tigers bounced back on Thursday to take a 3-0 win over J.S. Leadership Academy in non-district action, leaving them with an 11-6, 1-1 worksheet. Cecilia’s Lady Bulldogs lost both their Dist. 4-III matches, falling to North Vermilion and Northside while slipping to 3-15, 0-3 for the season. Breaux Bridge, which has yet to begin its District 2-II campaign, broke even last week, losing to Comeaux on Sept. 26 while edging Academy of the Sacred Heart 3-2 on Thursday. The Lady Tigers lost their first two sets but then rallied for three straight wins to wrap up the match. The Bridge will bring an 8-7 into district play this week. •Thursday, Oct. 6 – St. Martinville at Northside (Dist. 4-III); Cecilia hosts Teurlings Catholic (Dist. 4-III); Breaux Bridge hosts Beau Chene (Dist. 2-II). •Friday-Saturday, Oct. 7-8: Breaux Bridge and St. Martinville in Terrebonne tournaments. •Saturday, Oct. 8 – Cecilia in Lutcher tournaments. •Tuesday, Oct. 11 – St. Martinville at Cecilia (Dist. 4-III); Breaux Bridge hosts Carencro (Dist. 2-II). SM: Malana Dalcourt 2 kills, 4 blocks, 20 digs, 7 assists; Raina Mason 1 kill, 3 blocks, 14 digs, 15 assists; Kalyn Cormier 6 kills, 1 block, 13 digs; Torian Owens 6 kills, 1 block, 18 digs; Ali Kately 3 kills, 9 blocks, 7 digs; Tori Louis 7 kills, 1 block; I’niyah Kately 13 digs; Krislyn Latiolais 12 digs. SM: Sydnie Allen 2 kills, 5 digs, 9 assists; Kalyn Cormier 1 kill, 2 aces, 1 block, 3 digs; Malana Dalcourt 1 kill, 2 digs, 3 assists; Tiffany Simon 1 kill, 2 aces, 3 digs; Raina Mason 3 aces, 1 digs, 6 assists; Caitlane Landry 2 kills, 1 digs; Tori Louis 3 kills, 1 assist; Jordan Landry 1 kill, 2 digs; Ali Kately 3 kills, 4 digs; Torian Owens 4 kills, 4 digs; I’niyah Kately 4 digs; Kirslyn Latiolais 2 digs; Tyler Fontenette 1 dig. Records: St. Martinville 11-6, 1-1.